Energy drink and vitamin pills, next to written notes and a laptop computer being used in studying. Energy drinks typically contain sugars and caffeine or other stimulants. They provide an energy boost, but excessive consumption of such drinks can lead to agitation and insomnia. 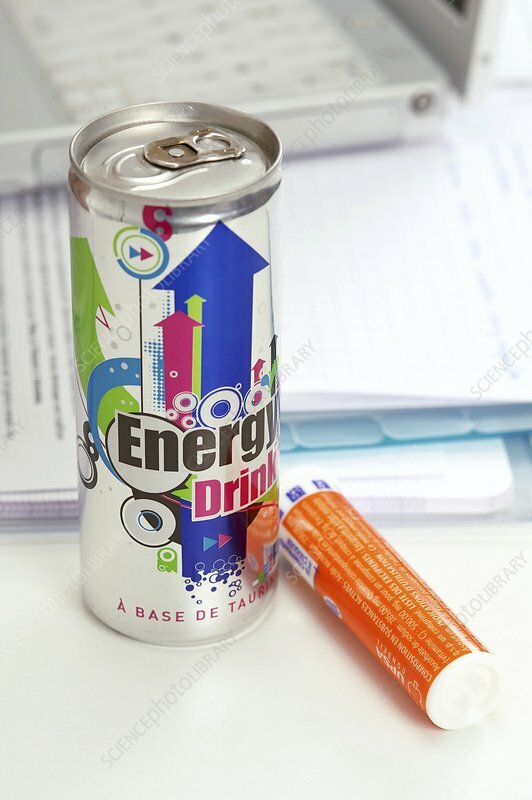 This French brand of energy drink contains the chemical taurine. The packet at lower right contains effervescent pills of vitamin C (ascorbic acid). Such pills are taken to supplement the vitamin C obtained in a normal diet.